FAIRFIELD – “Ghosts: French Holocaust Children,” a photographic installation by Robert Hirsch using photographs and other documents collected by Nazi-hunters Beate and Serge Klarsfeld, is now on display at the Walsh Gallery of the Quick Center for Performing Arts at Fairfield University. Co-sponsored by the Bennett Center for Judaic Studies and The Humanities Center at Fairfield University, Hirsch describes the exhibit as “an ethereal commemoration to these children’s abbreviated lives.” It will be on display through March 2. 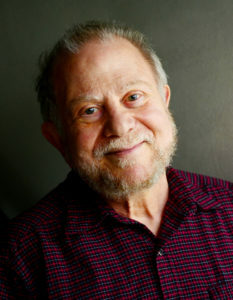 A resident of New York, Hirsch is a photographer and writer whose books include Seizing the Light: A Social History of Photography, Light and Lens: Photography in the Digital Age, Photographic Possibilities: The Expressive Use of Equipment, Ideas, Materials, and Processes, and Exploring Color Photography: From Film to Pixels. He is a former associate editor for Digital Camera (UK) and Photovision Magazine, and a contributor to Afterimage, Exposure, Buffalo Spree, The Focal Encyclopedia of Photography, Fotophile, and World Book Encyclopedia. He is the former executive director of CEPA Gallery and has curated numerous exhibitions. His own images have been internationally exhibited in over 200 solo and group shows. Recently, he spoke with the Ledger about the genesis of “Ghosts” and his hopes that the exhibit serves both to commemorate the children lost during the Holocaust and to combat hate and antisemitism. JEWISH LEDGER (JL): Can you explain how your exhibit “Ghosts: French Holocaust Children” came about? ROBERT HIRSCH (RH): During World War II, over 11,000 Jewish children were deported from France to Auschwitz and other Nazi death camps in convoys that rolled until the day Paris was liberated by the Allies. As the consequence of antisemitism, a disbelief in human equality of Jews, these children were among more than 75,000 French Jews deported under the Nazi extermination plan called the “Final Solution to the Jewish question.” Of those French Jews transported, only 2,564 survived the Shoah. Most of the youths represented in Ghosts were arrested by the French gendarmes on orders of the Vichy French State government that actively collaborated with the Nazis from 1940–1944. At most 300 of these Jewish children survived. For the rest, all that remains are their photographs. In this time of increasing worldwide antisemitism, Holocaust denial, and the rise of authoritarian leaders, Ghosts is a three-dimensional installation that acts as an ethereal commemoration to these children’s abbreviated lives. JL: Where did the photos you use come from and what was it about them that spoke to you? RH: Ghosts is based on historic documents and photographs collected by author, lawyer, and Nazi-hunter Serge Klarsfeld and his wife Beate Klarsfeld. I have reinterpreted this material in the form of three 1/5-scale boxcars containing over 600 expressionistic portraits of deported French Jewish children, plus a series of mural-and mini-sized individual portraits – all of which acts as an ethereal commemoration to these children’s abbreviated lives. Seeing the black-and-white photographs made after the Allies liberated the concentration camps, naked corpses of women and men with numbers tattooed on their arms piled degradingly like so much kindling, made me feel as if my head had been split open and filled with monstrous fiends who pursued total annihilation. No images, before or since, have so profoundly affected me. They left an indelible streak of anxiety upon my psyche. Clearly, everything I had previously been taught to believe about the world was wrong. Suddenly, I found myself besieged with ancient hateful beliefs, a rapidly spreading mental plague that resulted in the horrific deaths of millions of people whose only crime was being different from the group in power. These appalling, grainy, black-and-white photographs of the Holocaust subconsciously influenced my future, becoming a place I had never been, but could not leave. To deal with this psychological invasion I began making interpretive images about the hateful behavior and the Holocaust, but it took me decades of aesthetic and intellectual wresting with the enormity of these ghastly crimes before I was satisfied I was not trivializing the subject. One result of this struggle has been Ghosts. In remaking these portraits, I utilized photography’s power for detail and specificity. I visually put audiences face to face with other people, enabling one to look into the eyes of another and hopefully see a little bit of oneself. Optimistically this can make one feel a bit more connected and compassionate towards our fellow humans. JL: Do you have a connection to the Holocaust? If so, how did this inform your work on this project? RH: All of my family members who remained in Europe were murdered by “Hitler’s Willing Executioners.” I think it is essential that, as the last of the Holocaust survivors die, contemporary artists and historians step forward to serve as the next generation of storytellers who can bear witness and keep alive the memory of what anti-Semitism tried to extinguish. In this sense, Ghosts acts as post-memory witness willing meaning to those who suffered the Holocaust, crossing the barrier of time that separates us from past events. It is my position that, even without being a direct witness, innovative artistic and scholarly investigations are necessary if the Shoah is going to remain pertinent in the coming years. In this ensuing manner, how the Holocaust is known, discussed, and understood becomes an on-going transgenerational obligation. Failing to recharge these memories is tantamount to a belated Nazi victory. If the story is allowed to fade, Holocaust deniers and other Jew-haters will seize the opportunity to deliberately conceal, distort, and misapply the truth about the Shoah. JL: What do you want those who see “Ghosts” to take away from it? RH: Ghosts’ blends outer and inner realities, constructing stories that examine the extreme boundaries of human behavior regarding identity, loss, memory, racism, and wickedness. This allows Ghosts to explore the space between art and history from the perspective that expressive interpretive photo-based imagery can represent the unimaginable. This approach promotes multiple ways of perceiving the Holocaust that cannot be achieved through traditional documentary photography, encouraging critical thinking and empathy. In turn, this calls for an accurate analysis of anti-Semitism – its nature, its sources, and the way it operates – to facilitate the deconstruction of these deadly clichés. If we allow this bigotry to target one group without challenging it, it is only a matter of time before other minority groups are pursued and persecuted as well affecting all our passion for personal freedom. Therefore, combatting anti-Semitism is vital not only for Jewish people, but for anyone who values human life and the pursuit of social justice that transcends borders and epochs. 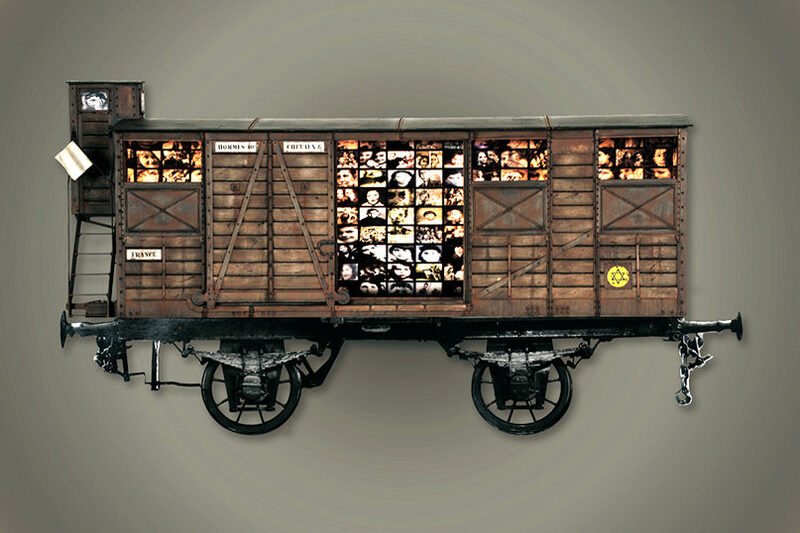 CAP: A “holocaust boxcar” created by Robert Hirsch is part of a fairfield university exhibit.